All scenes created via Harmony Stand Alone are independent and local to the computer. 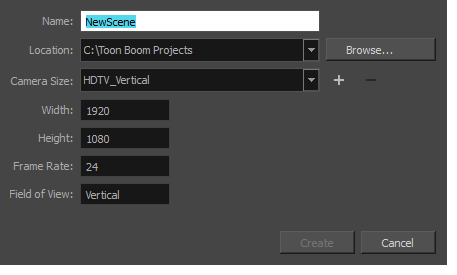 You can create or open a scene using the Welcome screen or the File menu. In the Name field, type the scene’s name. To select the scene’s location, in the Location section, click Browse. NOTE: In general, the scene name should not exceed 23 characters and cannot contain special characters, such as *&^%!. From the Camera Size menu, select a scene resolution and click Create Scene. A new scene is created. ‣ From the top menu, select File > New. ‣ In the File toolbar, click the New button. ‣ Press Ctrl + N (Windows/Linux) or ⌘ + N (Mac OS X). The New Scene dialog box opens. In the Project Name field, type the scene's name. Select a scene directory by clicking the Browse button. NOTE: The scene name cannot exceed 23 characters and cannot contain special characters, such as *&^%!. In the Resolution window, select the scene’s resolution and click Create. Create a new scene from the Welcome screen or from the File menu in Harmony. ‣ Select a scene resolution from the Camera sizes drop-down menu. ‣ Set a custom resolution by changing the values in the Width and Height fields. This preset will not be saved. ‣ Add a new resolution to the list by clicking the Add button. You can delete a custom resolution from the Resolution list by selecting it, and clicking the Delete button. In the New Resolution dialog box, fill in the following fields and click Create. ‣ Resolution Name: Name your new resolution. ‣ Resolution: Set the width, height and aspect ratio of the resolution. ‣ Field of View: Set the horizontal fit and vertical fit. ‣ Frame Rate: Type the scene's frame rate per second. ‣ From the top menu, select File > Open. ‣ In the File toolbar, click the Browse button. ‣ Press Ctrl + O (Windows/Linux) or ⌘ + O (Mac OS X). The Open Scene browser opens. Browse and select the desired *.xstage file. In the Recent Scenes section, click Open. In the Open a Scene section, select a scene from the list. From the top menu, select File > Open Recent. Select a scene from the displayed list.